For Leaf Peepers and those just seeking some peace of mind, Fall is one of the best times to visit Lake Tahoe. The summer crowds have retreated, towns are quiet, winds are calm, and it’s often warm and sunny to boot. Cooler evenings turn the sky ultra-blue, and turn the leaves into brilliant displays of gold and crimson. For Leaf Peepers and those just seeking some peace of mind, Fall is one of the best times to visit Lake Tahoe. The summer crowds have retreated, towns are quiet, winds are calm, and it’s often warm and sunny to boot. Cooler evenings turn the sky ultra-blue, and turn the leaves into brilliant displays of gold and crimson. BTW, the water in Lake Tahoe is actually warmer now than in July! Walking and Hiking during September or October brings a nice sense of tranquility – the kind you really need after the summer bustle. Quaking Aspen and Cottonwood trees show fall colors for a few weeks, so timing is everything to catch peak fall foliage. The journey is worth it. The ultimate place to see fall foliage and golden color is in Hope Valley. This beautiful area is just south of South Lake Tahoe and Meyers and has some great hiking trails. There are campgrounds and a few small resorts to stay in like Kirkwood ski resort, Sorensen's Resort, and Hope Valley Resort. Sorensen's Resort is a nice place to enjoy lunch at their café, and wander among the aspen trees and darling cabins for rent. Hope Valley Resort offers delicious hamburgers with the views of foothills and fall foliage. Hot Tip: Weekend traffic can fill up this part of Highway 88. Head down to Hope Valley early in the morning or for sunset. To reach Marlette Lake, on the east side of Lake Tahoe, you will need to hike a 5 mile trail. Along the way you will see masses of aspen trees changing color in the fall. The hike itself is great any time of year, but in the fall, it's cooler and less crowded. The trailhead is located at the Spooner Lake parking area. There is a parking fee for the park. Hot Tip: This is also a great place to mountain bike. On the other side of Hope Valley is the small town of Markleeville. The aspen trees around this area follow some small creeks, so their color is especially vibrant in the fall. In Markleeville you can visit several restaurants and bars, do some shopping in various boutiques and antique shops and take a dip in Grover Hot Springs—located in the middle of a beautiful valley. Hot Tip: Some of the best places to see the changing leaves in Markleeville is at the Markleeville courthouse. 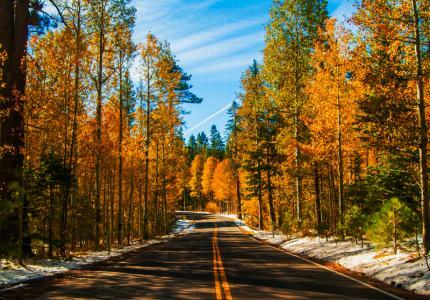 Ebbetts Pass on Highway 4 on the south side of Hope Valley is a national scenic byway and home to thousands of aspen trees which put on a colorful display every fall. Some of the best places to see color is along the East Carson River and Kinney Creek. You can see a lot of the trees from your car, but pulling over is a treat for a picnic or just to do some walking in nature. Hot Tip: Highway 4 is very steep and windy so there is a lot less traffic than on Highway 88. This is a great place to see fall colors, and to watch the salmon spawning. Each fall the Lake Tahoe Kokanee Salmon run up Taylor Creek and can be seen at the Center's Stream Profile Chamber. The chamber is located 1/4 mile down the Rainbow Trail and allows visitors to study a diverted section of Taylor Creek through a panel of aquarium windows. After check-in at the Center, a hike along the child- and disabled-friendly walking paths is a must-do. Hot Tip: The Center with its nature exhibits is a good place for children. Luther Pass is between Meyers and Hope Valley along Highway 89. There are some wonderful thick groves of aspens along the road and plenty of turnouts to stop and snap some photos. In fact, this area is where many professional photographers go for their fall shots. Go a step further and park at the Big Meadow Trailhead and hike part of the Tahoe Rim Trail where you will see creeks, fir and pine trees as well as aspen. Hot Tip: Some of the best places to see fall color is around the free campgrounds on Luther Pass. Look for the brown signs. This beautiful alpine lake on the South Shore near Mount Tallac has some of the best fall color over water combinations at the lake. Just the road down to the lake will give you lots of aspen tree views. The General Store at Fallen Leaf Lake has boat and kayak rentals as well as drinks and food. Hot Tip: The best leaf views and photography opportunities are at the Saint Francis Chapel. If you want fall color right on the shore of Lake Tahoe, visit Zephyr Cove on the east side of the lake. Located along Highway 50, the resort has a small grove of aspen trees along the shore that turn red, orange and yellow in October. During this time, the water is really calm and there are less crowds. Hot Tip: Grab a coffee at the Zephyr Cove Resort and enjoy it under the trees. If you don't mind a little day trip, head west on Highway 50 toward Placerville and drive into Apple Hill. This small group of farms, ranches and wineries have fall foliage later in the season, but they also have everything else that goes with fall: harvest festivals, apple picking, pumpkins, wine tasting and views of golden leaves and grapes vines. Hot Tip: The weekend traffic at Apple Hill in the fall can be a little crazy and this place is perhaps best visited on a weekday or on Nevada Day (October 31st). Up at the top of the highest year-round pass in the Sierra the leaves turn a little early, but the views of North Lake Tahoe across the meadows of gold is beautiful. The Mount Rose Meadows trail is easy and great for families and the disabled. There is a bathroom and views of the local peaks including Slide Mountain and Mount Rose. Hot Tip: If you want to hike to the top of Mount Rose, the trailhead is still open in the fall and the 10-mile hike to the top will give you views of all of Lake Tahoe, Reno and Carson City.